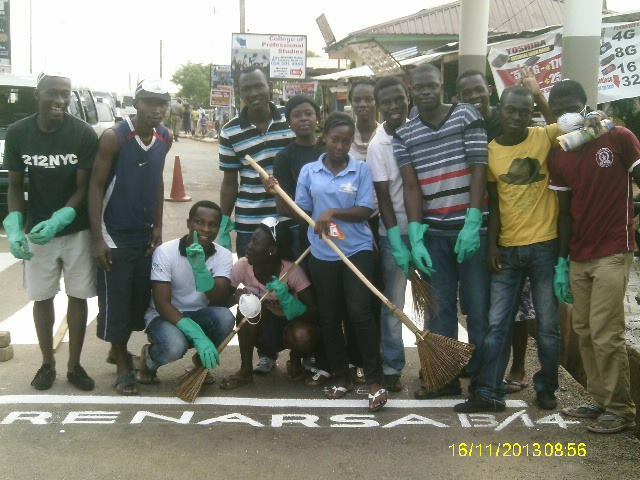 On Saturday the 16th of November 2013, a cleanup exercise was organized by Patriots Ghana Kwame Nkrumah University of Science and Technology Chapter in collaboration with the Student Representative Council (SRC), Non Residential Executives and Zoomlion Ghana LTD at Ayeduase. The exercise took place at the Ayeduase Gate/ Entrance to the University and Other areas of Ayeduase that needed cleaning. The SRC MP for Ayeduase, Mr. Prince Ofori, and the the President of PATRIOTS Ghana KNUST gathered all the materials needed for the clean-up whilst a vehicle with a public address system informed citizens. 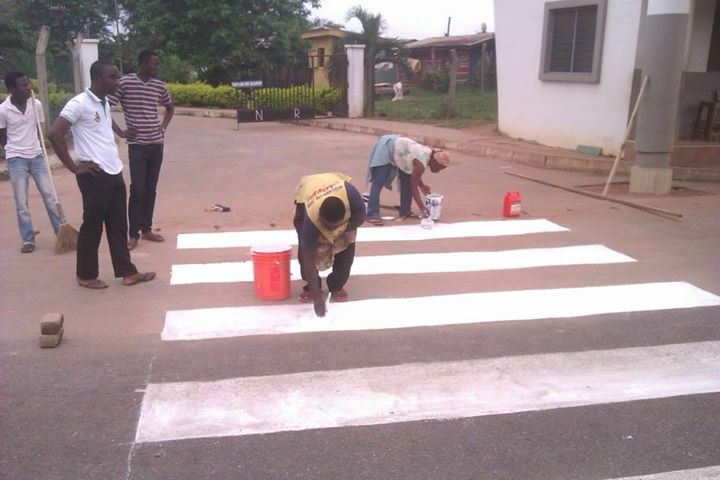 The event began as early as 5:30 am with the sweeping of streets to avoid the busy hours of traffic and also so the students could start painting the zebra crossing, kind courtesy RENARSA. 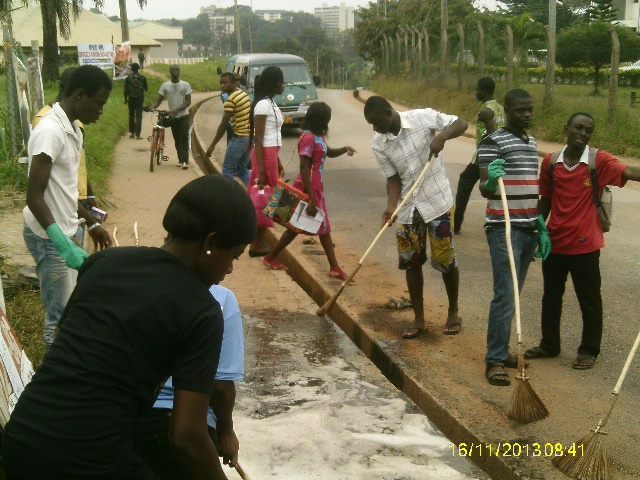 The exercise included the cleaning of gutters, weeding, sweeping, gathering and disposing of refuse etc. The volunteers were offered gloves, boots and nose masks for protection and also brooms, rakes, shovels, wheel barrows, cutlasses etc. to ensure that the exercise was done effectively without any health problems. The Ghana Police personnel and the Campus Security personnel also assisted the students by directing the vehicles to avoid any traffic accidents while the students cleaned the streets. The Assembly man of Ayeduase drove around with the metropolitan bus to announce to the residents about the cleanup exercise and also talk about keeping the environment clean. He warned them not to dispose of their refuse in the bushes and the nearby pond. 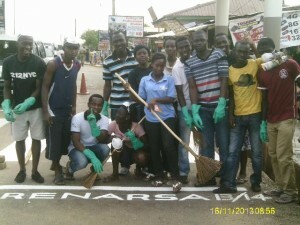 In all about 50 volunteers joined together in the exercise and happily cleaned amidst music. After the exercise all the students and volunteers gathered at the cafeteria for the Kenkey Party and also to socialize and share experiences in volunteering. On behalf of Patriots Ghana and the SRC, we appreciate the Kumasi Metropolitan Assembly, Zoomlion Ghana LTD and all the amazing volunteers that came together to make the exercise a success. Patriots Ghana would also like to invite all to get involved its activities in Developing the Nation with Passion. Volunteer, Intern or Become a Member of PATRIOTS GHANA.